In a real-life version of Mega Shark Vs. Giant Octopus, two colossal beasts squared off in the Pacific Ocean near Queensland, Australia. However, unlike the movie, this wasn’t a Mega Shark versus a Giant Octopus. This was a Mega Shark versus a slightly smaller shark. Like the movie, this fight to the finish was caught on camera. 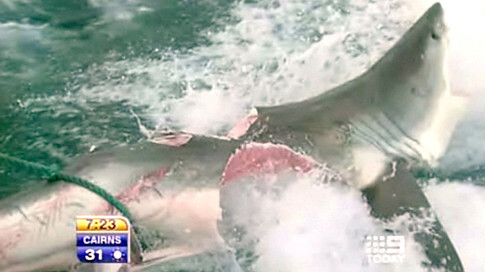 The 10-foot shark was caught on a fishing expedition. The 20-foot monster great white shark saw an easy opportunity for a snack, and bit his brother shark nearly in half in one bite! Australia has had anti-shark netting in place since 1962, and this Jaws-sized monster shark so near the beach is a good reason as to why that net is still there. Amazingly, the bitten shark was still alive when it was reeled in, but odds are not for long given that his torso is nearly bitten in twain. For the record, Mega Shark Vs. Giant Octopus isn’t that bad, considering it’s a SyFy channel movie. It’s horribly cheesy, but it’s that “so bad it’s good” kind of cheese. I recommend it for any fan of terrible movies.